Looking for an uncommon name with an on-trend sound? You’re in luck! 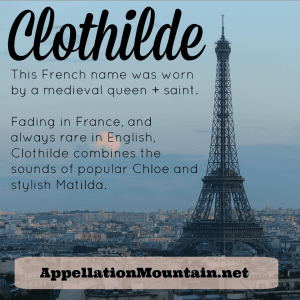 Out-There Alphabet Week starts with Clothilde as our Baby Name of the Day. Back in the very early Middle Ages, Clovis was King of the Franks. He knit together an unruly group of tribes, founded the Merovingian dynasty, and converted to Christianity on Christmas Day, 496. For his conversion, credit goes to his wife. A princess of Burgundy, her name is thought to mean “famous in battle” in Frankish. Chrodechildis was the Latin form, and it’s been whispered down the alley into the more approachable Clothilde over the years. That’s because the queen became a saint for her efforts to convert her regal spouse. Word is that she was generous, and spent her later years helping the poor and downtrodden. 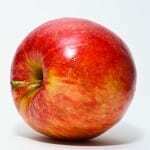 That was the sixth century, of course, and plenty of names have disappeared over the years. 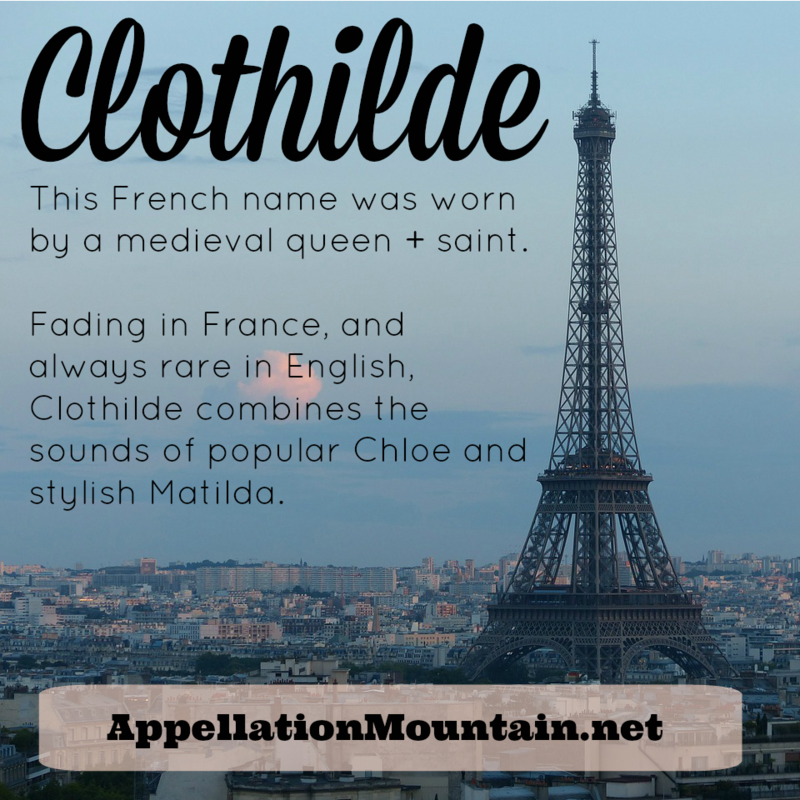 Clothilde likely survived in large part because the saint was popular. A fountain in an abbey founded by the queen was said to cure skin ailments. She’s the patron saint of queens and widows, of those in exile and the lame. Years later, a French princess was named Marie Adelaide Clotilde Xaviere, and known as Marie Clotilde – note the even sleeker spelling of the name. Marie Clotilde married the King of Sardinia in 1796. She was known as Clotilda in her new country. 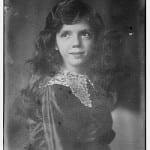 A handful of girls were called Clothilde in the nineteenth and early twentieth centuries. The last year five girls were given the name was 1946, down from a peak of 15 in 1918. Clotilde fared much better, as was given to five girls as late as 2006. This spelling peaked back in 1924, when there were three dozen newborn Clotildes. Clotilda falls somewhere in between. She was last given to five or more girls in 1961, and peaked in 1916, with twelve newborn Clotildas. The name is equally out of favor in France. There was a singer called Clothilde in the 1960s – though she was born Elisabeth Beauvais, and the stage name was imposed by a heavy-handed manager. Nineteenth century French writer Clotilde de Vaux, born Clotilde-Marie. Clo Graves, born Clotilde Augusta Inez Mary Graves, an Irish playwright and author from the late nineteenth and early twentieth centuries. From the same era, Clotilde von Derp, a trailblazer in modern dance with her husband and dance partner, Alexander Sakharoff. Lastly, the name remains royal thanks to Clotilde, Princess of Venice and Piedmont. 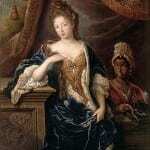 But the princess married into the House of Savoy. She was born Clotilde Courau, the daughter of Jean-Claude and Catherine, sister to Christiane, Camille, and Capucine. None of this makes Clothilde seem ready for a comeback. Chloe has just left the US Top Ten, and has been a Top 100 favorite since 1998. Matilda is hanging out at a fairly obscure #644. But Matilda seems to be steadily climbing, the kind of name that’s a decade or two away from being everywhere. Mash the two sounds together, and Clothilde is the logical result. French names for girls have a long history of use in American English. Madeleine, Genevieve, Clothilde – the name fits right in. Nicknames abound, too – Clo and Chloe/Cloe, of course, but also Tillie and Tilda. We’re just one high profile birth announcement or fictional character away from Clothilde becoming the name everyone was waiting for. Yep, I think the presence of “clot” in this name is a big obstacle to its becoming more popular in the English-speaking world. It also is less pretty when pronounced in English, as is the case with so many French names. My son’s (francophone) swimming instructor is called Marie-Clothilde which I think is lovely if a bit ‘heavy.’ I also know an Irish Catholic Clotilda who I assume was named after the saint. I have to honestly say, this is one ugly name. Just like how Hettie sees clot, I see clodhopper.. The Sundance Channel aired the first season of the French series The Returned with English subtitles about a year or so ago (sort of unusual for American TV), and one of the stars is the gorgeous Clothilde Hesme. My brain went straight to her as soon as I read the title of this post. I think I must have a weird brain, because as much as I like this name (and I really do!) I can’t get around the word “clot”. I have similar issues with Scarlet and “scar”. I’d love to meet a baby Clothilde, but I don’t think I could use it myself for that reason.